A lift chair is a type of recliner that has a strong lifting mechanism in the base of the chair. The lifting mechanism raises the chair into the air to make it easier and safer to stand and sit. Today in addition to having a motorized base, the backrest and footrest are also controlled electronically. This makes it very easy to find a comfortable position while sleeping, watching TV, or reading. Lift chairs, which are also sometimes called riser recliners, come in all different shapes and sizes, so it is important to purchase one that will work with your body type. 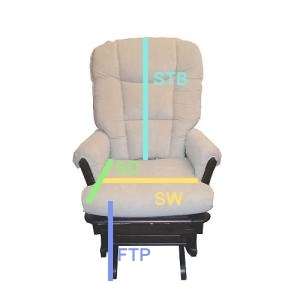 The image above shows how a dealer might display a lift chair’s measurements. They are explained below. Weight Capacity:This describes how much weight the chair can support. It is a good idea to always give your self a little bit of wiggle room when choosing a lift chair. Usually allow for an extra 20% of weight, so for this chair you would probably want to weigh at most 320 pounds. These measurements can provide you with a real sense of how the chair will fit your body. It is a good idea to measure one of your existing chairs before you begin shopping for a new lift chair. This way you will have a set of measurements you can relate to and compare to the lift chairs measurements. One other consideration is how close the chair can be placed to the wall and still recline. This distance varies and some lift chairs can be placed 6 inches from the wall and still recline. This type of lift chair are is called a wall hugger and is not the norm. Most lift chairs need to be placed around 18 to 24 inches from the wall.